To celebrate the launch of You Are More Than You Think, the author Andrew Jenkins will sign & dedicate a limited number of his new first edition book. To get your signed copy please click Buy Signed Copy button below. You Are More Than You Think was published on 17 April 2014 and is available to purchase now. Have you ever had the feeling that life is passing you by? That somehow, somewhere, you took a wrong turning, and that you’re not living the life you should be living? That you’re not the person you could be, if only…? In this stunningly wide-ranging and fascinating book, Andrew Jenkins takes the reader on a journey of exploration into just how these feelings arise, through the development of what he calls the ‘acquired self’, and how, by making use of the extraordinary plasticity of our brains, we can re-educate our thoughts and behaviours and return to our ‘authentic selves’ – and have happy, effective and fulfilled lives. Learn more about yourself and who you’re meant to be? Accomplish something positive, something great in your life that reconnects you to your deepest dreams and desires? Be guided step by step back to your ‘authentic self’ without being constrained by limitation? 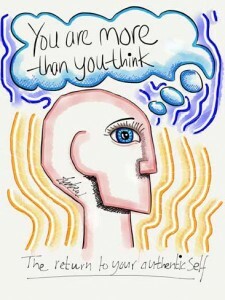 You Are More Than You Think is the result of over 25 years working with high-level executives, managers and teams, in which Andrew Jenkins has explored and applied what works best to help individuals become fully themselves, so their teams, their organisations, and all around them can benefit.